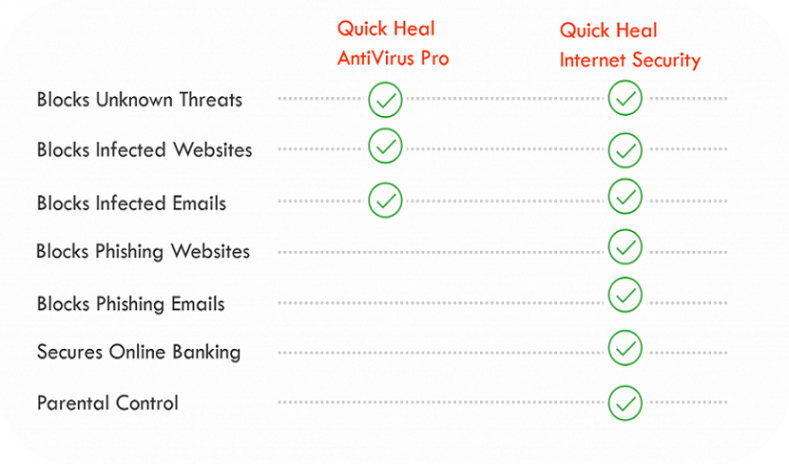 Quick Heal AntiVirus Pro vs Quick Heal Internet Security: What’s the difference? In today’s post, you will get to learn some of the basic and important differences between two of our products – Quick Heal AntiVirus Pro vs Quick Heal Internet Security. While, both these products work to defend your system against malware, viruses and other threats, they differ on the level of strength of protection that they provide. Read the rest of the post to know more. Quick Heal AntiVirus Pro is the basic level of security that we provide to the Windows platform. Quick Heal Internet Security, on the other hand, is a level higher than AntiVirus Pro. This is the Advanced DNAScan feature that protects your computer against virus, Trojans and malware of unknown characteristics. Such threats are more dangerous because they are not known and hence there is no immediate solution for them. So, what this feature does is, it analyzes the behavior of such programs and blocks them before they can infect your machine. This is the Web Security feature that automatically stops you from landing on websites that have hidden malicious codes. 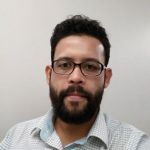 In some cases, you may unknowingly click on a link that is connected to an infected website. And simply visiting the website can infect your computer. Attackers might send you unwanted or unexpected emails that carry malicious attachments or links to infected websites. Our Email Security feature protects you from such threats by blocking such emails from reaching your inbox. You might be tricked into visiting a fake banking, shopping or social network site that asks for your login ID and password. These are known as phishing websites, and any information you give away on these sites fall right into the hands of hackers. Quick Heal’s Anti-phishing feature automatically detects such websites and prevents you from visiting them. Hackers not only use emails to drop malware on their targets’ machine, but also craft emails that carry links to fake and phishing websites. These emails usually carry a sense of urgency or excitement to trick the targeted user into visiting a fake banking or shopping website and give away sensitive details like as user name, passwords, bank details, etc. Quick Heal detects such types of emails and blocks them from reaching the user. Online banking might be convenient but it puts your financial information at risk. You can never tell whether your online banking site is the genuine website or a fake one designed by a hacker to steal your information. Quick Heal secures your online banking sessions and online shopping activities with Safe Banking – a feature that creates a secure, sterile environment where you can bank, shop, and pay your bills online securely and without any risk of getting spied upon by hackers. Uncontrolled or unmonitored Internet access can be a bad influence on your children and their academic careers. With millions of websites on the Internet, your children are constantly at risk of coming across unwanted entities including sexual predators, hackers, adult content, inappropriate gaming platforms, scammers, etc. The Parental Control feature lets you easily control and schedule Internet access for your kids. With it, you can block websites that are not appropriate for your kids. You can also decide the days and timings during which your kids can use the Internet. quickheal is all in all in my vew. It must protect both the devices & fool proof.